Technology is advancing as you are reading this right now. If you are presenting on a technology topic, shouldn't your presentation look as techy and advanced as technology is today? We believe it should, which is why we have provided you with the best presentation templates that are designed with impressive high-resolution graphics that will give your presentation a modern and unique look. Here, you can download Free Technology Powerpoint Templates that will not only enhance your audience's attention but will also present your information in a clean and organized layout. Technology is what everyone is talking about, so impress your audience using a Powerpoint Template that will blow their minds. 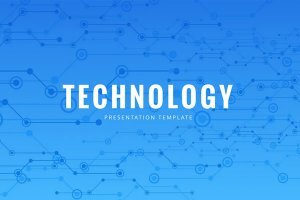 This Technology Powerpoint Template has a unique graphic design of high quality that can be easily edited.